Just when it seemed that iPoker regulation had come to a halt in 2016, we discover that iPoker could be on the fast tract to becoming legal. OnlinePokerReport revealed on Tuesday that the state budget, Senate Resolution No. R4330, includes a clause to regulate online poker. Should the budget pass with that clause intact, New York would go from “no chance of regulation in 2016” to the fourth U.S. state to regulate iPoker. While there is plenty of reason to be optimistic over this development, this is far from being a sure thing. Online poker supporters in New York are understandably optimistic over this addition to the state budget. This addition shows that support for iPoker is indeed growing amongst legislators. As PPA Executive Director John Pappas told OnlinePokerReport, “There is a broader support for iPoker today than ever before from both the industry and politicians.” Over the last couple of years, we’ve seen very little movement from lawmakers and so far this year we’ve seen a bill move out of committee and now the matter has been attached to the budget. Frankly, this is a bit above our expectations for the issue in 2016. We expected a bill to be filed but to receive the same amount of attention as past years. 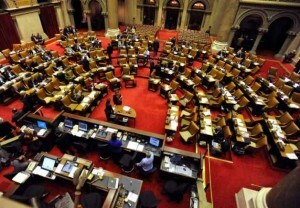 However, the addition to the budget gives renewed hope that New York might pull off the upset and regulate online poker before California or Pennsylvania. Another reason to be optimistic is that the state budget is due in just a couple of weeks. As such, this is not a matter that’s going to sit around and go stale as the legislative session winds down. Unless there is a budget gridlock like we saw last year in PA, we should know by early next month whether iPoker will be regulated via the budget. Despite renewed optimism for iPoker regulation in 2016, this isn’t even close to a slam dunk. It’s probably more like a deep 3-point shot by a 60% shooter. This isn’t the first time that iPoker was included in the state budget. It was included in the 2013 state budget, but failed to make it into the final version. Another item of note is that Daily Fantasy Sports are included as part of the budget. Some lawmakers may be uncomfortable expanding both into online poker and DFS. As such, something would have to give. Frankly, DFS will generate much more potential revenue for the state than iPoker and would win out in such a compromise. What Happens if New York Regulates? If New York pulls off the miracle in 2016, it will change the presumed course of iPoker regulation in the United States. The fourth largest state in terms of population will be online and chances are we will see PokerStars immediately expand into the state. Afterwards, you can expect PokerStars NJ to team up to form to the first viable US interstate online poker network. Following New York regulating, I believe you will see both PA and CA fast track iGaming regulation to keep pace. We could see other states start to examine the issue knowing that multiple major markets are available to partner with. In short, New York could become the new lynchpin for the US regulated marketplace. Naturally, this is all speculation and next week we could be back to talking about “maybe 2018” for NY iPoker. For now, one can hope that the Empire State can become the new land of opportunity for online poker. Tagged New York iPoker, New York Online Poker, online poker New York, online poker NY. Bookmark the permalink.